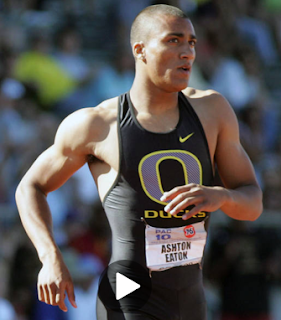 Speaking of superhumans, below is a picture of decathlete Ashton Eaton, who may soon have a claim on the title World's Greatest Athlete. The last time (2009) the USATF National Championships were here in Eugene, I predicted great things ahead for him. Eaton, then only a junior, placed second in the US championships. This year (competition completed yesterday) he won by a huge margin, with a total that is the 5th best all-time US score and 13th best in the world. Eaton has incredible times in the sprints (PRs around 10.3, 13.3, 46, IIRC) and is still just learning the technical aspects of the high jump and the throws. In the next few years he could break the world record. Two winters ago UO had a family day at the rec center, and invited some prominent athletes to spend time with the kids. My twins got to play dodgeball with Eaton for about half an hour -- there were no other families on the court. Eaton took it easy on them :-) When they get older I'll remind them about their time with the World's Greatest Athlete! I've noticed that decathlete's tend to be about 6'1'', ideally. I am not sure if any exist over 6'4.'' It seems that it's not possible to be really mesomorphic over about 6'3'' or so.